Interstate 69W entails just 1.4 miles of the Loop 20 freeway between the World Trade Bridge and Interstate 35 in north Laredo. This stretch doubles as the southernmost stretch of U.S. 59. The planned route of IH 69W takes the interstate northeast from Laredo to George West, the future north end of IH 69C, and onward to Victoria and a rendezvous with IH 69E. Groundbreaking set for May 23, 2016 will begin a $22 million project to convert the existing at-grade crossing between Loop 20 and U.S. 59 and International Boulevard.The International Boulevard Overpass Project will require no additional right of way and no right of way costs were incurred, thus reducing the overall price.2 This project is part of the overall scope of upgrading the IH 69W corridor through north and east Laredo. Once complete, the Loop 20 and U.S. 59 freeway will extend nearly 2.5 miles east of IH 35. Flyovers shuttle motorists from IH 35 to IH 69W and U.S. 59 at a partially built stack interchange. Photo taken 09/28/07. Frontage roads extend U.S. 59 and LP 20 east from IH 35 to Bucky Houdmann Boulevard. The remainder of Bob Bullock Loop south to U.S. 59 Business (Saunders Street) travels as a four-lane boulevard or divided highway. 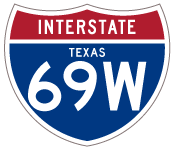 Interstates 69E and 69W will combine at Victoria, Texas to form the Interstate 69 mainline leading northeast to Houston. Construction of these freeways is many years out. Green outs made to Exit 8A signs along IH 35 north reflect the upgrade of Loop 20 to both IH 69W and U.S. 59. Presently a directional T interchange joins the two freeways on the north side of Laredo. Photo taken by Jeff Royston (03/16/16). Interstate 69W and U.S. 59 combine west from IH 35 to the World Trade International Bridge linking Laredo, Texas with Nuevo Laredo, Tamaulipas, Mexico. The bridge opened to traffic on April 15, 2000. Photo taken by Jeff Royston (03/16/16). “First Section of Interstate 69 Comes to Laredo.” Alliance for I-69 Texas web site, June 26, 2014. “International Blvd. 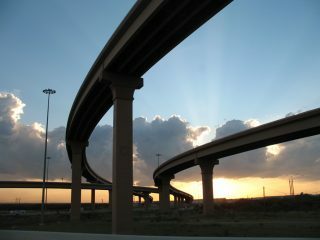 Overpass Project in Laredo begins May 23.” http://www.txdot.gov/inside-txdot/media-center/local-news/laredo/025-2016.html Texas Department of Transportation web site, May 18, 2016. Page updated May 19, 2016.